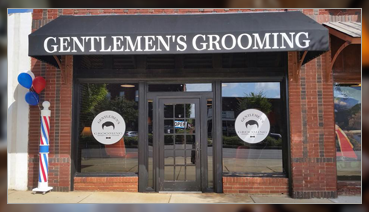 Gentlemen’s Grooming in Tuscaloosa, AL is a real barber shop for real guys. We didn’t invent the barber shop, a concept which has been around for years. We just came up with a better way to package and promote it. We’ve brought the barber shop into the modern age. We’re all about remembering the best of the past while incorporating the future. We offer great haircuts, Tighten Up (trim around ear and neck) Little Buddy (12 years old and under). We also provide hot lather shaves, beard trims, eyebrow wax, facial massage, color (10 minute semi hair color). 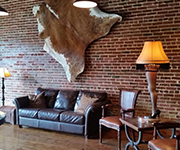 We maintain a traditional atmosphere combined with a few modern touches like an exclusive in-shop music system, televisions at each cutting station, and a big screen television to keep clients entertained while they wait. All haircuts come with a shampoo, hot steam towel, styling, and a complimentary drink. With all the haircut chains and overpriced salons today, it's nice to know that you can still go to an independently owned traditional barber shop with a modern edge. Gentlemen’s Grooming barbers aren’t stuck in the past. 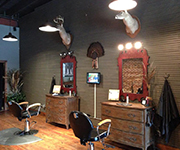 We do excellent traditional barber shop haircuts, but we can also handle trendy styles and long hair. No matter what your style, you’ll leave our shop looking better than you’ve ever had. From flattops to faux hawks, we’re the best at cutting men’s hair because that’s all we do. You won’t find smelly color or perm solutions in our shop. What you will find is the best haircut. 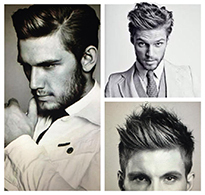 We have over 25 years of combined experience in cutting men’s hair. We try to staff our shop to keep wait times to a minimum, but we sometimes have a wait during peak times, but not often. If you walk in and there is a wait, you can put your name on the list and keep your place. 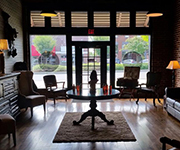 You can shop in the adjoining exclusive men’s store or settle into a comfortable leather chair, enjoy a free soft drink, and watch sports on the flat-screen TV or read a magazine. The moment our clients walk in the door, they realize providing excellent customer service and amazing haircuts are our main goal. From old school haircuts to the most popular current hairstyles, our barbers create haircuts that enhance people’s appearance and get them noticed over and over again. Visit Gentlemen’s Grooming today for the ultimate haircut experience. No appointments needed, but feel free to call us at 205-764-5969 if you have any questions. Copyright © Gentlemen’s Grooming, 2015. All rights reserved.